....The third annual Quickie Construction Seminar will be held on Saturday, 29 November, 1980 at Quickie Aircraft Corporation, Hangar 68, Mojave Airport, Mojave, California. ....The seminar will be a joint venture with Rutan Aircraft Factory. ....The purpose of the day is to provide an education in the building of sandwich composite aircraft such as the Quickie, Q2, and Long-Eze. ....Lunch will be available at a cafe approximately 200 feet from our facility. In years past we have had upwards of 500 people attend. Therefore, we ask that you notify us if you will be attending. Also, because there will be a large turnout, it would be helpful if visitors would bring their own folding chairs. ....Since the July newsletter, we have made two trips across the country to both the Oshkosh and Tullahoma EAA sponsored flyins. Four Quickies attended the Oshkosh flyin including N77Q, as well as Quickies belonging to George Holmes, Garry LeGare, and Lourdes Academy. Several more were flying in the vicinity, but did not have sufficient flight time. .....George Holmes flew to Oshkosh all the way from San Francisco, CA. By the time he returned home, his aircraft had over 370 hours total time in the hands of more than 20 pilots. George had one of the most photographed airplanes at Oshkosh because he brought along a giant windup key that he placed just over the rear wing. We heard several men telling their wives that the windup key provided a backup power source for the aircraft! .....The Lourdes Academy Quickie should have its first flight by veteran Steve Wittman by the time you read this. While at Oshkosh, we were able to bring the Lourdes Academy people and Don Taylor together to discuss using their aircraft for Don to set some 500 kg. world records. Those of you who are ardent EAAâ€™s will recognize Don Taylor as the individual who flew a T- 18 homebuilt around the world several years back. He has been wanting to repeat the feat with a much lighter aircraft, which has not previously been accomplished, and has been searching for a Quickie to use for several years. If the arrangements can be worked out, several long distance flights would be made during mid 1981. 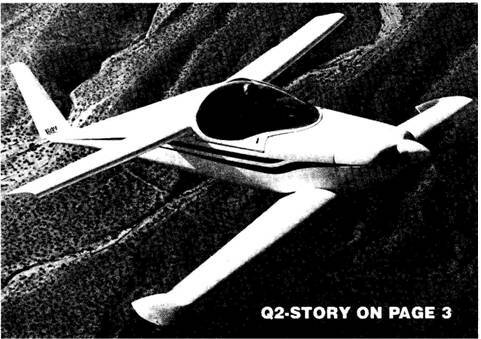 .....The Tullahoma EAA flyin provided the introduction of the Q2, the new two-place Quickie, which is described elsewhere in this newsletter. We had intended also to take N77Q there, having left it near Chicago following Oshkosh to save time, but weather did not permit us retrieving it in time to take it to the flyin. The new Q2 was very well received at Tullahoma, and proved to be one of the fastest aircraft in the flyby pattern. Also present at Tullahoma was a Quickie belonging to the Quickie Club of Chattanooga, flown there by Bob Clark.